Now that we’ve all been alerted to the severe dangers of tanning beds and too much sun exposure, it’s time to take a look at products that offer natural-looking colour without the fear of the harmful effects of sun-damaged skin or worse, skin cancer. I was never a tanning bed junkie, but I definitely put in my fair efforts trying to get that golden sun-kissed colour. Regrets? YES. Oh, how I wish I could rewind the clock on that mistake! 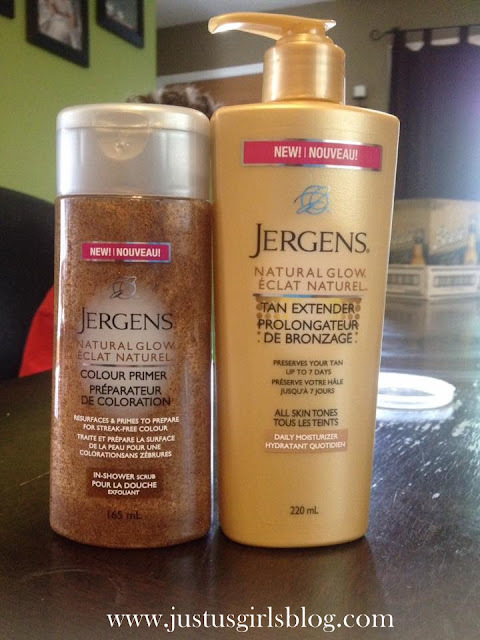 So I was pretty excited to try the new Jergens Natural Glow products, Colour Primer In-Shower Scrub and Tan Extender Daily Moisturizer. So how well do these self-tanning products work? I've been trying out both Natural Glow products for a few weeks now. I started out with the Colour Primer. It’s an in-shower scrub meant to exfoliate your skin prior to an application of colour. Just as easy as your regular shower gel, I just squeezed a dab onto my loofah and lightly scrubbed my entire body. Perfect. Soft newborn baby skin, ready for some streak-free colour. I didn’t get a chance to use a colour-enhancing lotion. I spent the next few days gardening and working outdoors (with SPF protection, of course! ), and each night after my shower, I applied the Natural Glow Tan Extender. I used it exactly the way I would use a regular daily moisturizer straight out of the shower. And I definitely noticed my skin begin to darken into a nice natural glow, exactly the way the bottle advertised. I used the primer only once a week and the tan extender daily, and I followed this routine for two weeks. These products left my skin feeling soft and smooth, and I have gorgeous colour! I definitely recommend these products to my readers. All thumbs up from this Just-Us Girl. Both of these Jergens Natural Glow products retail for $12.99 and can be purchased at most major retailers. For more information about the Natural Glow and other Jergens products, be sure to head to www.jergens.ca. Disclosure: All opinions are my own. I received both Jergens Natural Glow products at no cost for the purpose of this review. No other compensation was received.